I used it for repairing the onborough transport car. Resurrected by belt exchange and tension adjustment, it is moving smoothly. This review is about item#278467. Both quality and price, balanced, personal use, thankful goods is. This review is about item#278616. It is used for an exchange belt of a self-propelled mowing machine. I bought five belts to overuse the mowers. There was also a high price belt, but are you satisfied with trying the cheapest one It is confirmation. This review is about item#278607. It was used for replacement due to aged deterioration. It is an order by model number, but there are many other types, and it is very helpful. This review is about item#278792. This review is about item#278494. Cheap and quick response, thank you. I will use it in the future. This review is about item#00278607. Although it is normal maintenance, even if I carelessly forget to order it will arrive soon, but I bought a spare belt as it is cheap. This review is about item#278695. Thank you for your prompt response after ordering. I would like to use it when ordering a separate part. This review is about item#278747. It is a maker item and you can use it with confidence. Because Monotaro is rich in inventory and cheaper than home center I am always saved. This review is about item#279045. I am satisfied with the product. Manufacturer of trust. However, scrolling is troublesome from 20 to 100 or more at the beginning of the search in the monotalou, so please improve it so that you go directly to the target product by searching the model number. This review is about item#278643. I was saved because there was no B type in the nearby home center. Goods are also firm. This review is about item#00278521. It is very expensive to purchase the same item at the home center, but it is shocking at the price first because it is half price if it is a montalow site! This review is about item#00278862. I regularly purchase it. 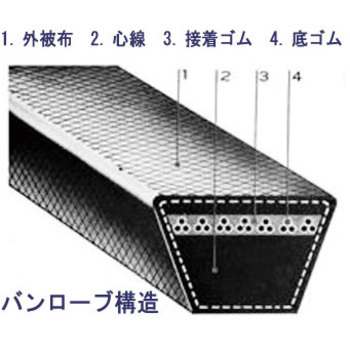 It is used for a fan belt for air ventilation. This review is about item#279036. There are many kinds of V Belts, it is convenient to deliver troublesome to going to buy immediately. Although it may be a cheap monotaro brand, this size is missing, classic from a long time ago, it made it a safe band chemistry. The red label is better, but because the price is higher, I made it to this item. Although it installed, it can be relieved without a problem. This review is about item#278661. I am working fine using using agricultural equipment repair. This review is about item#279081. Position Reason Maker products are safe and secure. Purchased for driving the straw cutter, it fully fulfills its function. Because it is a sufficient place with general-purpose goods, cheaper is saved. This review is about item#00278941. This review is about item#00278731. This review is about item#00277767. This review is about item#00278634.